Well, actually, there are a couple of big flaps to talk about. Of course there is the big flap that I'm building to hang on the back side of my left wing, but there was also a different kind of flap in the RV-12 builder community last week. The story as I understand it is that my building buddy Kyle, lead singer and tambourine tuner for The Jackson Two, was installing a welded part in his RV-12 when a very disconcerting issue arose. 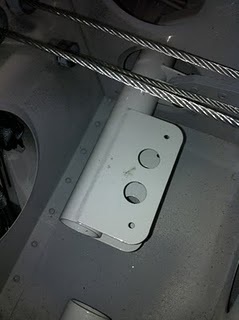 The part in question is part of a chain of parts that work together to provide a linkage between the control stick and the flaperons. That's pretty important stuff; the flaperons are what allow a pilot to turn the airplane, or to prevent the airplane from turning of its own volition. Both are equally important to everything in the pilot's life, with the possible exception of retirement planning. Those flat plates with the holes in them are welded to the supporting tube and powder coated by Van's. In theory, anyway. As Kyle was preparing to match drill one of the plates, it fell off in his hands. Apparently that one had been tack welded to hold it in place for a weld that was never performed. This evening, we were getting ready to match drill the wd-1215 brackets with the wd-1214 flaperon torque tubes and the wd-1215 bracket flange came off in my hand. Looks like there was no welding other than a tac weld. There were a number of "Thanks for pointing that out - I will check mine immediately" types of replies, but it didn't take long for the fissiparous nature of the builder community to show. Mixed in were a number of messages stating that the building is the final inspector and in essence saying "Sh!t happens, it's your job to deal with it." Which, as I stated later once I got involved in the thread, is good advice that quite widely misses the point. Just called VANS. They are sending me two new WD1215's L and R. They said they have recvd a couple other calls this morning in regards to these parts. The parts person i spoke with said i should have called them (VANS) first before posting here. I take issue with that. One poster said he advised VANS in Feb 2010. That is a year ago and nothing was done. I wonder if a jury would see it that way, particularly in the case of an E-LSA where Van's Aircraft is the manufacturer of record. The E-LSAs are too new for that to have been tested in a courtroom and we all hope that it never gets tested in that way, but it does seem that a preponderance of caution on the part of Van's would be a good approach. I am also of the opinion that another of these defective parts showing up a year after the first known report with no record of a notice or bulletin being sent to assemblers does not inspire confidence. I've talked about the E-LSA rules here before, and the difference between that set of rules and the normal experimental aircraft rules. In a nutshell, with the E-LSA we are required to build exactly to the plans, but a normal experimental can be modified from the design by the builder. In exchange for the loss of autonomy in the build process, the manufacturer (in this case, Van's) remains as the manufacturer of record, and ostensibly the liable source should anything go wrong. With the other set of rules, the builder becomes the manufacturer of record and also takes on the liability. Lawsuits should never even be whispered about; it’s only bad for your hobby. I don’t know anything about LSA but as far as EAB goes it falls to the manufacture/builder and you don’t want it any other way because there would be no kits available for us to build. The response of Van's parts employee, if reported in context accurately, was a discouraging note, I thought. Hopefully, that doesn't reflect the attitude of the Van's staff as a whole and the employee will be counseled that, when a safety of flight issue is involved, it's perhaps not the time to rely on a single, formal line of communication. In the case of welds (and worse, welds covered by thick powder coat), I sure hope Van's isn't counting on me to find poor workmanship. I'm am neither qualified nor equipped to judge the quality of a weld. To put it bluntly, that is what I am paying Van's to do. Not all poorly welded parts are going to conveniently and fortunately fall apart quite as easily as Kyle's did. I also stridently disagree that discussion of potential lawsuits is somehow off limits. It is the world we live in and playing ostrich is not going to solve anything. I think it would be foolish to not consider where the liability lies with the airplanes we are building. One of the benefits of an E-LSA over E-AB is where the liability lies; you can't market the benefit when it's convenient and hide from it when it's not. We sign a contract saying that we upheld our end of the deal by building exactly to plans; the manufacturer has to hold up their end too by meeting their responsibility to make sure their product is safe. Finally, I find any criticism of Kyle's decision to share his experience with us abhorrent and frankly I'm shocked by it. I now can't help but wonder what other problems have been hidden from us. I understand the motivation behind it - credibility and trust once lost are very difficult to recover - but this is serious business here. There is no room in this industry for the hiding of problems like this. Van's released a service advisory regarding this issue very quickly, thus making the point about "calling them first" moot. For some reason, this was viewed as justification for arguing against any criticism of Van's, and somehow exculpated Van's of any responsibility for that part being shipped in the first place. One commenter went as far as saying that we all owed Van's an apology (which seems exactly backwards to me) and that "anyone that can't differentiate a tack welded part (powder coat or not) from a fully welded part should not be building an eab/lsa." That's a fine point, as far as it goes. Given that it is the builder's life that's on the line, a high degree of last-chance quality control is certainly prudent. On the other hand, there are two parties in this transaction: one that may or may not have the requisite background and experience to know precisely how a weld is supposed to look, and one that has decades of experience in knowing precisely how a weld is supposed to look. Only one of those parties is selling those parts for profit. That profit is earned by doing the work that the first party can't do for himself, and ensuring that the work they do is complete, accurate, and safe. I'm the first to say that this could have happened to me just as easily as it happened to Kyle. I trusted (incorrectly, as it turns out) Van's to take care of the basics of quality control. They are a trusted manufacturer with years of experience; that factored heavily in my decision to purchase from them. I suspect a lot of us got a very low cost lesson through this incident; I know that I did. Education is half the of the "recreation and education" basis for building our own airplanes and I'm happy to have been taught a very valuable lesson about it, and I'm even happier that it came at no cost. There's no hiding the fact, though, that the cost could have been tremendously higher. Oh, and those decades of experience that Van's has? It would have been measured in months if the qualifications for building one of their kits included the abilities required to have built the thing from plans. I'm sure there are purists that believe the RV-12 was a mistake for Van's because it is targeted at inexperienced builders that don't have the chops to build a "real" airplane, but that changes nothing. The relative simplicity of the RV-12 attracts a builder that would never have attempted to build any of the other RVs - or at least one such builder, anyway. I speak for myself alone when I say that I clearly do not have the experience or knowledge to gauge the workmanship of every single part of the kit and that I am (was) leaning on Van's to do that for me. Between that and the work I have to do on getting the RV-6 through its annual inspection, there were a few days that I stayed away from working on the RV-12. Which brings us back to Big Flap #1. All of those parts that I fabricated before needed to be attached to the flaperon spar. That meant match drilling. Those washers on the bolt running between the two parts are used simply to set the required spacing, near as I can guess. I would have preferred to have been given an explicit measurement, truth be told. Too much is at risk to trust that I found the correct washers mixed into the big bag o' washers. This part in particular was an interesting riveting job. Those holes near the vertical part require AN470 round head solid rivets, and getting that head up flush against the side of the vertical plate was going to be a problem. Fortunately, I learned a long time ago that Van's will tell you when the direction of the rivet matters; if they don't specify a direction, I just use whichever direction is easiest. 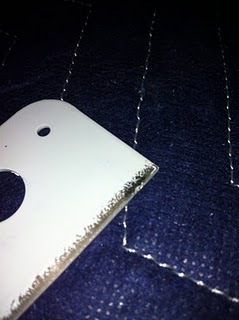 In this case, I just inserted the rivet from the other side. Moving on to the little ribs, I found that in some cases the rib wouldn't fit into the spar straight in because the flanges of the spar were bent inward. I just put the ribs in at an angle, then straightened them up. The riveting of the ribs was the same as riveting the paddle: in some cases it was easier to bring the rivet through the rib and into the spar, in others it was easier to go through the spar into the rib. A few of the ribs used both options. Then I had to peel blue plastic off of the flaperon skins, one of my least favorite things to do. I had just clecoed the skins to the flaperon skeleton prior to riveting them on when I heard on the control tower scanner that the guy with the Piper Aztec hangared next door was taxiing in. I had the hangar door open, and this guy insists on blasting my hangar with a nearly full throttle blast of air when making the turn in front of his hangar before parking. That would have blown my wings off of the rack and done all kinds of damage. In the years he's been doing this and despite my having pointed out to him the mess he makes in my hangar when he does it, he continues to do it with reckless abandon. I decided that it would be a good idea to get the door down and move my car. It was close enough to quitting time that I just decided to leave the riveting until later.